There's nothing "most popular" about Vermont's new education cost-control law. For many of the state's small school districts, Act 46, which emphasizes cost-effectiveness over local control, looks like a great big bully. But the state's largest school district, Burlington, isn't a fan of the new law, either. Rather, it doesn't like the math. Burlington's proposed spending plan for next year calls for an increase of 3.14 percent — more than last year's tight 1.75 percent increase, but still a relatively small hike. Even so, the increase would prompt a penalty under Act 46 that would result in city property owners being taxed at twice the regular rate on roughly $1.4 million of next year's $70.9 million budget. Act 46 attempts to control the growth in education spending by limiting it to an average of 2 percent per pupil statewide. That allows larger budget increases in lower-spending districts and smaller increases in higher-spending ones. The formula casts the state as a judicious parent, willing to dole out the largest allowance to the most frugal children, and the smallest one to the biggest spenders. The Burlington School District is an average child when it comes to spending as defined by Act 46, which uses a metric based on "equalized" pupils — a head count that is weighted for factors such as poverty and English-language proficiency. The law says Burlington's equalized per-pupil spending can increase no more than 2.14 percent, to $14,133 next year. The proposed budget would increase it 6.6 percent, to $14,750, putting Burlington in the penalty box. School officials around the state are complaining about this so-called percentage spending "cap." The Manchester School Board is hoping other boards will sign a letter it drafted last week telling lawmakers to revise the law. Gov. Peter Shumlin pledged a quick fix for the penalties when the legislature convenes in January, before the boards complete their budgets in preparation for Town Meeting Day votes. On Tuesday, the governor sharpened his opposition to the cap and told Seven Days he wants to repeal it or delay its implementation for at least one year. He said Democratic legislative leaders have a plan to quickly put the cap out of commission. They'd need a deal by mid-January at the latest. Both fans and foes of the law are dubious that any substantive change can happen that quickly. Rep. Don Turner (R-Milton), the House minority leader, vowed to do all he can to keep the cap in place this year and to oppose repeal of the measure, which, he pointed out, is a temporary measure anyway. "It was a two-year cap to rein in spending," Turner said. Will Shumlin's change happen, and if so, will it come soon enough for Burlington School Board members? At a special meeting on December 3 with a half dozen lawmakers, they vented plenty about Act 46. "It just adds another cog in this terrible wheel we have to go through," Mark Porter, Burlington School Board chair, said before the meeting. "Understand that we do need you," Superintendent Yaw Obeng told the lawmakers, urging them to make fixes to Act 46. Obeng and others pointed out that Burlington's nearly 3,900 students have unusual needs. About 46 percent of them qualify for free or reduced-cost lunch, compared with 39 percent statewide; 13.6 percent of Burlington students are English language learners, compared to 3 percent statewide. Burlington is a hub for the Vermont Refugee Resettlement Program, and city schools educate students from Nepal, Tibet, Somalia, Sudan, Bhutan and Bosnia, among other places. Those students bring many talents and enrich the city's diversity, Obeng and board members said, but the district must offer extra assistance: translators, homeschool liaisons, supplementary English language courses. Board members said Burlington needs help to provide these resources to each new batch of refugees, all of whom deserve support. "This week we had 12 new kids. Last week there were over 10 new kids. It doesn't stop," said school board member Anne Judson. In fact, Burlington spends quite a bit more than the wonky "equalized per pupil spending" figure applied in Act 46, which credits the city with more students than it actually has. School board members don't always acknowledge this when they are asking for more money. Per-pupil cost in fiscal year 2014 was around $18,710, according to state numbers based on the actual number of students attending city schools. That's $5,389 more than the Act 46 calculation, and well above the national average of $11,355. For now, Burlington school officials aren't answering one of the most important questions about the budget: What will it do to city property tax bills? Estimates should be available by the end of the month, according to Nathan Lavery, Burlington schools' finance director. In the meantime, the board is likely to take another pass at the $70.9 million proposal, which could reduce the total. Much of the increase in the current version is for raises: The salary and benefits line would increase 3.6 percent, although the actual number could vary depending on the outcome of negotiations under way with the district's 400 full-time teachers, whose median pay runs $71,624 under a contract that expires next summer. The district is digging out after years of budget deficits and overspending, with a new superintendent and business manager providing leadership. As the district attempts to right itself financially, the state is doing the same. Vermont's education spending hit an all-time high of $1.55 billion last year, generating a new round of complaints about the property tax burden on homeowners. School staffing in Vermont has increased despite 20 years of declining student enrollment, and Vermont has many small schools — including some just a few miles apart. Vermont has the lowest student-teacher ratio in the nation: 10-to-1, compared with the national average of 16-to-1. 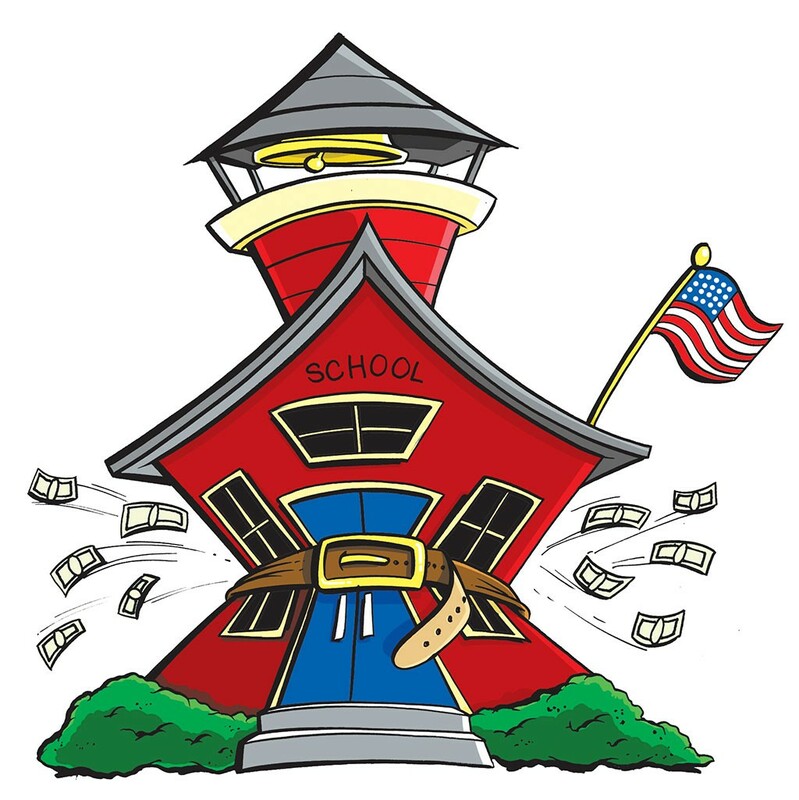 The state's average per-pupil spending is the highest in the nation, at $21,263 annually. But solutions don't come easy when Vermont voters rail against property taxes, then complain bitterly when their local school lacks for something. Turner said, however, that the priority in Vermont is no longer uncertain: "One of the things we heard loud and clear last election from our constituents was we had to rein in school spending." Act 46 offers a carrot — and waves a stick. The carrot encourages consolidation of school districts with tax incentives. The stick double-taxes districts on the amount they exceed the allowable spending threshold. So if a community owed $1 in statewide property taxes for $10 in spending, it would have to pay $2 for the same $10 when the penalty is applied. For Burlington, the double-tax penalty would be calculated on the roughly $1.4 million above the cap. Arguing against tighter budgets: Health care costs for school employees statewide could increase as much as 7 percent. And in Burlington, some federal grants are expected to shrink next year. "We are being squeezed in a number of different ways," said Lavery. For any revision to Act 46 to be useful, it has to happen quickly, before the budgets are set and warned in January, he said. Lawmakers who met with the Burlington board were not optimistic that was possible, but most of them vowed to push for modifications. "If there's going to be change, it's going to happen fast," said Sen. David Zuckerman (P/D-Chittenden) who is campaigning for lieutenant governor. Rep. Johannah Donovan (D- Burlington) sympathized with the critics of Act 46 but suggested that broad fixes to the new law weren't likely this year because of financial constraints. "I think some of us are dreading going back," she commented about returning to the legislature, calling the climate "very grim." Rep. Kurt Wright (R-Burlington) said emphatically that there is no way Act 46 will be repealed in January. "However, I think there will be a tweak," he said. For example, exempting health insurance increases from the cap is under discussion, according to Wright. Wright said he would consider minor revisions to the law, but he believes the cap is necessary to rein in spending. Many voters are frustrated with property taxes, and it's been difficult to address their concerns at the legislature, he said. "Every idea that we come up with for reform ... for various reasons, they were shot down," Wright said. So the cap should stay, he said. The Burlington School Board should propose a budget that doesn't trigger the penalty, Wright said, predicting that voters would defeat a spending plan with a double tax. "I think you will have to go back to the drawing board," Wright said. Porter, the board chair, said he understands that some voters are "tax weary," and he is attentive to that sentiment. But the board also has ambitions. Those include creating a new English language learners academy program, which would provide intensive instruction for newcomers, and expanded summer reading programs. The board also hopes to one day renovate or rebuild Burlington High School. Last year it spent more than $100,000 on consultants who drew up designs for a new high school that could cost as much as $40 million. For now, though, with the board addressing immediate fiscal challenges, the rebuilding proposal is on hold, and board members say they are scaling back their visions. "This year and last year we're in the licking-our-wounds stage," Porter said, and that's frustrating. "We didn't sign on to be in maintenance mode. We signed on to improve things." The original print version of this article was headlined "In Burlington, a New School Spending Limit Is Already Under Fire"